Grand Theft Auto III was a watershed moment in the gaming industry; . it It took an interesting (but somewhat unknown) franchise and took it to the next level and became one of the most influential games in recent years. Combining open ended game play with a variety of different game modes tossed into the mix. , The the title was also infamous for it’s lack of morality. The game allowed you to live out all of your violent fantasies as you worked your way up the organized crime corporate ladder. While not the first game to allow you to play the villain, this was the first that did it in such a violent, anti-social way. The game was an instant hit, big enough to ensure a sequel. 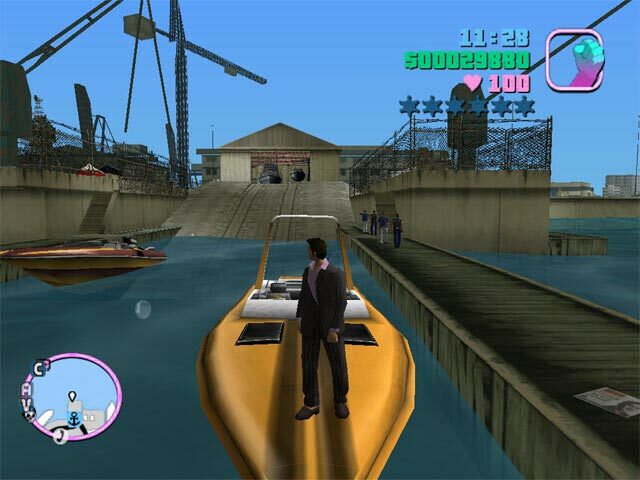 Rockstar delivered with Grand Theft Auto:Vice City (GTA:VC). 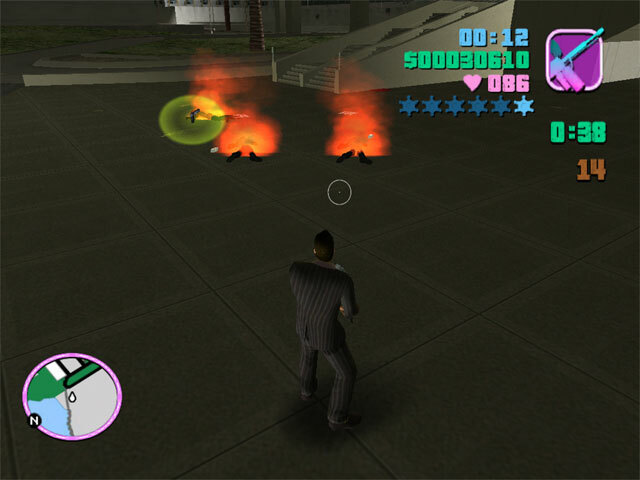 GTA:VC was released for the PS2 last year to much acclaim and Rockstar recently released it for the PC. GTA:VC takes the franchise back to the 80’s. You play Tommy Vercetti, a thug just out of prison, who’s sent down to Vice City to take care of a drug exchange. The exchange goes bad and now you’ve got to find the drugs, the money and take care of “bitness” “in Vice City. The game just reeks of the “me decade.” From the music to the clothing; Rockstar does a great job of immersing the player (the crowning moment for me was including the German version of “99 Red Balloons” instead of the English version). GTA:VC’s gameplay is amazing, . You never really get bored in the game due to the diversity of things to do in the game. You can earn money honestly by taxing to people around the city or by delivering pizza’s on a moped, or you can go the go the criminal route (which is a little more fun) by robbing stores, beating people up and taking their money, and by taking on various missions from the local crime lords. There is a central plotline to the game, but those are only represent a fraction of what there is to do in the game. The variety of things to do can be a little overwhelming at times (especially at the start) but once you get into the game you really understand what a wide open game GTA:VC is. The PC version is a direct port of the PS2 game with a few extras. The first thing games will notice is the higher resolution textures. The textures make the game look a lot better and the bright 80’s colors stand out even more than the PS2 version. The second new feature is the ability to re-skin Tommy if you so choose (Rockstar has a new skin which you can download here). The last (and best) is that you can use your own MP3’s in the game. So, if you’ve had your fill of 80’s nostalgia, you can use your own tunes in the game. I’ll just say it’s a lot of fun doing drive-bys listening to Danzig. As I mentioned earlier, the game play is GTA:VC amazing. You can control a wide variety of vehicles. You can operate everything from cars, to boats, helicopters, and motorcycles. The motorcycles are a lot of fun but they are dangerous. You can zip along the streets quickly but if you make a small mistake you get thrown off the bike and Tommy takes some damage. The wide variety of cars each is impressive. There are 20 plus cars in the game, . You have everything from sports cars to garbage trucks. While Rockstar didn’t license any cards from major manufacturers, it’s easy to recognize what some of the cars are supposed to be. Boats and helicopters are a nice bonus. You don’t spend a lot of time on them but they add a new wrinkle on how you approach certain problems. The wonderful thing about the game is that there are multiple ways to solve a problem (although violence is usually involved in all of them). You can take a direct method of charging in with full guns or you can stand back and slowly pick enemies off from a distance. Between the variety of solutions and the variety of missions there’s really something for everyone. The controls are fairly straight forward, you use the WASD combination to move forward, back, left and right, while the mouse controls the direction you face, cards and boats use the same WASD setup while the helicopters are a little more complicated. The helicopters take a while to get used to as the controls are not as intuitive as they are for the rest of the game. It takes some getting used to but it’s still not as smooth as the rest of the game and it’s one of the few bad points in the game. The missions are varied and interesting. Like the Grand Theft Auto III, you are trying to work your way up the criminal corporate ladder and while there is a core set of missions dedicated to this there are a ton of side missions. Some are easy, peaceful ways to earn money (delivering pizza, taxing people around the city, taking people to the emergency room in an ambulance) while others are more violent (assassinating people, going on violent rampages, as well as a host of missions for other criminal elements in town). There’s enough variety to keep you from getting bored with the game and enough variety to keep you interested in seeing what’s next. Some of the missions are difficult and will require you to replay them a few times, but there wasn’t a single mission that felt impossible. The only really big frustration for me was dealing with the helicopter missions and that just took time to get used to the controls. The sound in the game is top notch. From all of the classic 80’s music to the voice work the sound people at Rockstar did an amazing job with the game. The voice work in the game utilizes a lot of Hollywood celebrities and the casting is top notch. Ray (“Goodfellas”) Liota voices Tommy and brings a perfect grittiness to the role. Burt Reynolds plays a corrupt Real Estate Baron and Tom Sizemore voices crime lord Sonny Forelli. Finally Philip Michael Thomas makes an appearance, you remember him…he was in Miami Vice and uh…., gimme a second….not much else. He does add an extra bit of 80’s nostalgia and it’s a nice touch on Rockstar’s part. The game is a blast but it has some drawbacks. The biggest is that Tommy can’t swim, and in a city surrounded by water that can be a bit of a problem. There were a couple of occasions where I had completed a mission and missed a turn and Tommy ended up in the drink and I had to go back and replay the mission. The other big gripe is that the game occasionally would hang as it accessed the CD, I’m not sure if it was loading music or if it’s part of the copy protection scheme but it was annoying to be cruising along and have the game hang for a few seconds. The save game system relies on save points through out the city, another hold over from the console that’s a bit limiting but once you get further into the game it is not much of a problem. The game only crashed on me twice so the stability issues that plagued Grand Theft Auto III for the PC seemed to have been fixed (although your mileage may vary). Overall, this is probably one of the best games I’ve played so far this year. With it’s wide variety of gameplay and open-ended structure, the game provides a lot of bang for the buck. While the content of the game is not for everyone (the game is rated M for a reason), it’s a lot of fun and a vicarious thrill ride. Except for a few small glitches, this is one the most entertaining games available for the PC. With a strong M rating this game is strictly something that only adults should enjoy.